Cave paintings show that we have always been story tellers. When our ancestors sat around the fire in the cave, they passed on their wisdom and skills by way of tales about their exploits, and those of the people who’d gone before them. So why, when we encounter today’s version of the camp fire – a round table at a business networking event – do we find it difficult to unleash the story teller inside of us? How often have you been on the receiving end of an ‘elevator pitch’ that failed to gain your interest and stick in your memory? Of the people that I’ve networked with, the memorable ones have been those that told me stories about what they do. I’ve retold some of those stories when telling somebody new about the people I’ve met. But I’ve never retold an elevator pitch. Think about it – I bet you haven’t either. Sometimes, I meet people whose business lives seem to be filled with triumphs and victories. If they are so successful, then why do they get up before dawn to go and network over breakfast? There must be something they need – and something I might be able to help them with – if they only opened the door a little to show me what’s inside. The people I’ve remembered, and come to understand well enough to want to do business with, have allowed their vulnerability to show, as they’ve revealed something about themselves. I’ve been able to understand what makes them tick. I suspect there are two reasons that we don’t let ourselves be the story tellers that we naturally are. The first is that there’s an awful lot of emphasis put on ‘making elevator pitches’ and ‘pitching your offering in 30 seconds or less’. We’ve devalued the art and pleasure of telling and listening to stories. The second reason is that we lack some guidance on what to put in our stories. There, I can help you. 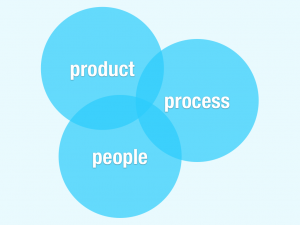 Use the 3 Ps, of PRODUCT, PROCESS, and PEOPLE. You’ll see that I use 3 Ps in my work as I describe the fundamentals of any company. If you cover each of those areas, you’ll tell a complete story. Describe how you came to develop your PRODUCT (which of course might be a service), who buys it and why. Tell your audience how you’d like to see it improve, because no product is perfect and someone there might be able to help you make that improvement. Let people know how you do what you do, for example by talking about the PROCESS you use to market your product, or how you win business. Be open about the bits of your process that you’d like to change, because you may be talking to someone who’s already made a similar change. And make sure you don’t just talk about yourself, but include the PEOPLE around you, whether that’s colleagues, investors or the wider network of contacts that you rely on. Why? Simply because we understand people not just from what they are themselves, but from the friends they have and the company they keep. Ask the speaker why someone would buy their PRODUCT and not a competitors. Get to understand who their competitors are. Check whether the speaker has experience of a PROCESS that you are having difficulty with. What lessons could you learn from their approach to marketing, for example? And dig into the PEOPLE aspect. Why does the speaker do what they’re doing? Why not something else? What choices have they had to make that got them to be in the same room as you on that day? I guarantee that if you remember and use the 3 Ps in your networking conversations you’ll give and get a more complete and revealing view of what’s going on. And you’ll enjoy the stories that you tell, and listen to, so much more than the pitches they’ll replace.